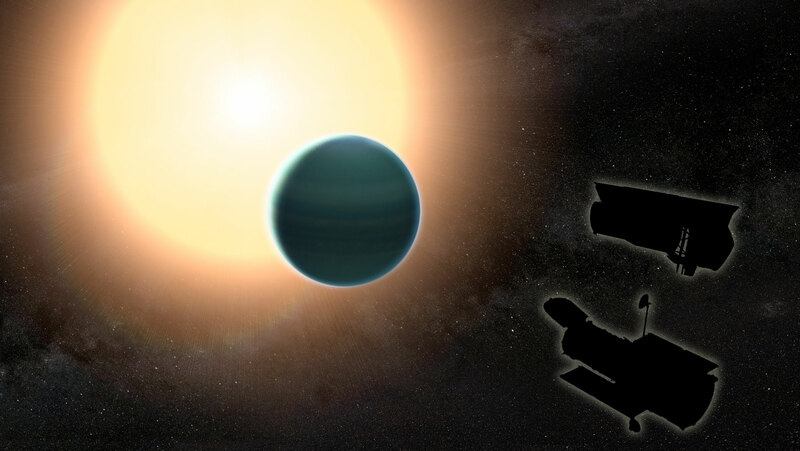 Using observations from the Hubble and Spitzer Space Telescopes, a team of astronomers reveals that the distant planet HAT-P-26b has a primitive atmosphere composed almost entirely of hydrogen and helium. Located about 437 light years away, HAT-P-26b orbits a star roughly twice as old as the sun. To study HAT-P-26b’s atmosphere, the astronomers used data from transits— occasions when the planet passed in front of its host star. During a transit, a fraction of the starlight gets filtered through the planet’s atmosphere, which absorbs some wavelengths of light but not others. By looking at how the signatures of the starlight change as a result of this filtering, researchers can work backward to figure out the chemical composition of the atmosphere. Be the first to comment on "Hubble & Spitzer Reveal Primitive Atmosphere Around Planet HAT-P-26b"